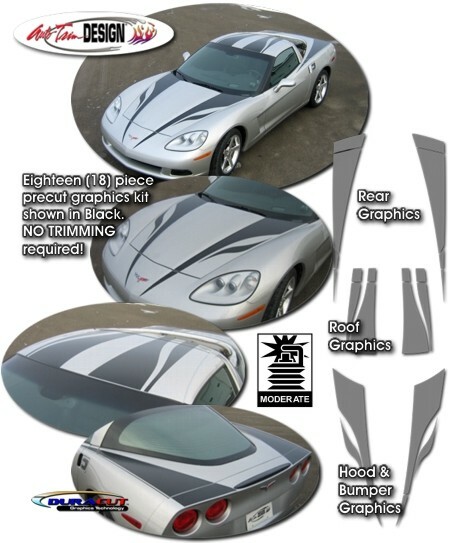 A more "Radical" approach to Rally Stripe Graphics, this eighteen (18) piece Bumper, Hood, Roof and Rear Deck Lid graphics kit will make your '05-Current Corvette C6 look awesome! With unique Pace Car styling, this kit is PRECUT and ready to install in a wide variety of colors - NO TRIMMING required! This stripe package is not just a set of 10" strips in a box. Our graphic kit consists of prefitted and contoured pieces as shown in the illustration. Please Note: This kit will fit the Chevrolet Corvette C6 convertible and Z06, however minimal trimming on the Rear Deck graphic set is required for the convertible model.